• Identify the most important parts of the Lathe and their functions. • Understand the Lathe safety rules. • Describe setup a cutting tool for machining. • Describe mount workpiece in the lathe. • Explain how to install cutting tool. • Describe the positioning the tool. 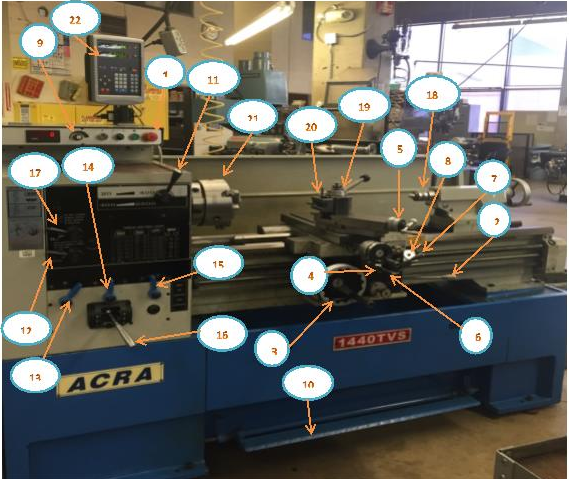 • Describe how to centering the workpiece and tailstock center. The lathe is a very versatile and important machine to know how to operate. This machine rotates a cylindrical object against a tool that the individual controls. The lathe is the forerunner of all machine tools. The work is held and rotated on its axis while the cutting tool is advanced along the line of a desired cut. The lathe is one of the most versatile machine tools used in industry. With suitable attachments, the lather may be used for turning, tapering, form turning, screw cutting, facing, dulling, boring, spinning, grinding, polishing operation. Cutting operations are performed with a cutting tool fed either parallel or at right angles to the axis of the work. The cutting tool may also be fed at an angle, relative to the axis of the work, for machining taper and angles. On a lathe, the tailstock does not rotate. Instead, the spindle that holds the stock rotates. Collets, centers, three jaw chucks, and other work-holding attachments can all be held in spindle. The tailstock can hold tools for drilling, threading, reaming, or cutting tapers. Additionally, it can support the end of the workpiece using a center and can be adjusted to adapt to different workpiece lengths. As always we should be aware of safety requirements and attempt to observe safety rules in order to eliminate serious injury to ourselves or others. Wear glasses, short sleeves, no tie, no rings, no trying to stop the work by hand. Stop the machine before trying to check the work. Don’t know how it works? –“Don’t run it.” Don’t use rags when the machine is running. 1. Remove the chuck key from the chuck immediately after use. Do not turn the lathe on if the chuck is still in the chuck key. 2. Turn the chuck or faceplate through by hand unless there are binding or clearance issues. 3. 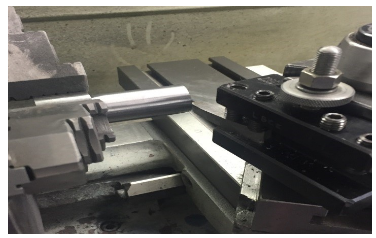 It is important that the chuck or faceplate is securely tightened onto the lathe’s spindle. 4. Move the tool bit to a safe distance from the chuck, collet, or face plate when inserting or removing your part. 5. Place the tool post holder to the left of the compound slide. This will ensure that the compound slide will not run into the spindle or chuck attachments. 6. When installing and removing chucks, face plates, and centers, always be sure all mating surfaces are clean and free from burrs. 7. Make sure the tool bit is sharp and has correct clearance angles. 8. Clamp the tool bit as short as possible in the tool holder to prevent it from vibrating or breaking. 9. Evenly apply and maintain cutting fluids. This will prevent morphing. 10. Do not run a threaded spindle in reverse. 11. Never run the machine faster than the recommended speed for the specific material. 12. If a chuck or faceplate is jammed on the spindle nose, contact an instructor to remove it. 13. If any filing is done on work revolving in the lathe, file left handed to prevent slipping into the chuck. 14. Always stop the machine before taking measurements. 15. Stop the machine when removing long stringy chips. Remove them with a pair of pliers. 16. Make sure that the tailstock is locked in place and that the proper adjustments are made if the work is being turned between centers. 17. When turning between centers, avoid cutting completely through the piece. 18. Do not use rags while the machine is running. 19. Remove tools from the tool post and tailstock before cleaning. 20. Do not use compressed air to clean the lathe. 21. Use care when cleaning the lathe. The cutting tools are sharp, the chips are sharp, and the workpiece may be sharp. 22. Make sure the machine is turned off and clean before leaving the workspace. Always remove the chuck wrench after use, avoid horseplay, keep floor area clean. Use care when cleaning the lathe, the cutting tools are sharp, the chips are sharp, and the workpiece may be sharp. • Why is proper Cutting Speed important? When set too high the tool breaks down quickly, time is lost replacing or reconditioning the tool. Too low of a CS results in low production. • Depth of cut for Roughing. • Depth of cut for Finishing. Notice the largest roughing cuts range from .010 to .030 depending on the material being machined, and .002 to .012 for the finish feed for the different materials. Notice the Feedrate for roughing cuts range from .005 to .020 depending on the material being machined, and .002 to .004 for the finish feed for the different materials. There are many different tools that can be used for turning, facing, and parting operations on the lathe. Each tool is usually composed of carbide as a base material, but can include other compounds. This section covers the different appearances and uses of lathe cutting tools. 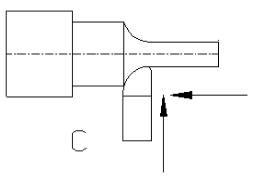 Figure A:depicts a standard turning tool to create a semi-square shoulder. If there is enough material behind the cutting edge, the tool can also be used for roughing. 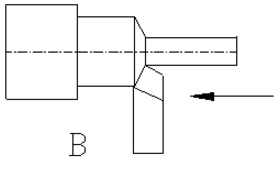 Figure B:depicts a standard turning tool with a lead angle. This angle enables for heavy roughing cuts. Ititalso possible to turn the tool to create a semi-square shoulder. Figure C:nose has a very large radius, which helps with fine finishes on both light and heavy cuts. The tool can also be used to form a corner radius. 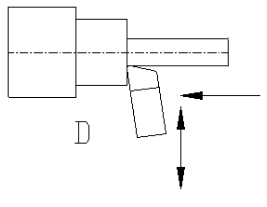 Figure D:depicts a rotated standard turning tool. Its nose leads the cutting edge to create light finishing cuts on the outside diameter and face of the shoulder. Figure E:depicts a form tool. Different forms can be ground into the tool, which will be reproduced onto the part. 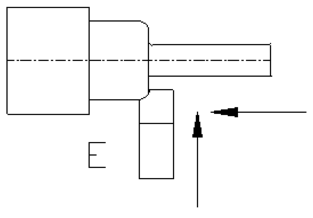 Figure F:depicts a facing tool. This cutter is used to face the end of a workpiece to provide for a smooth, flat finish. If the stock has a hole in the center, utilize a half-center to stabilize and support the workpiece. 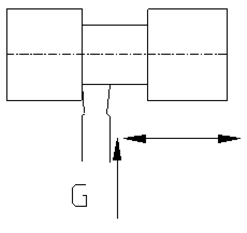 Figure G:depicts a grooving or under-cutting tool. As shown, it is used to cut grooves into the workpiece. When there are proper clearances, the tool can cut deeply, or cut to the left or right. 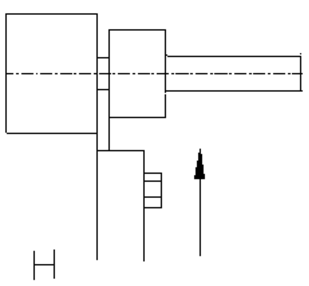 Figure H:depicts a parting tool. Parting tools cut off the stock at a certain length. This tool requires a preformed blade and holder. 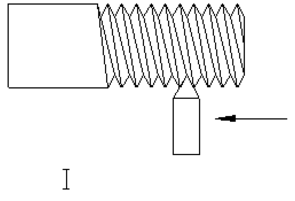 Figure I:depicts a 60° threading tool used to thread stock. • Move the toolpost to the left-hand side of the compound rest. • Mount a toolholder in the toolpost so that the set screw in the toolholder is about 1 inch beyond the toolpost. 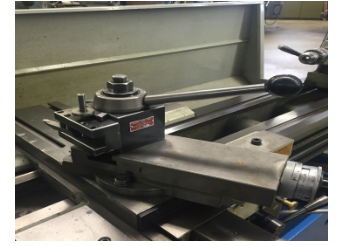 • Insert the proper cutting tool into the toolholder, having the tool extend .500 inch beyond the toolholder. • Set the cutting tool point to center height. Check it with straight rule or tailstock. • Check that the line center is running true. If it is not running true, remove the center, clean all surfaces, and replace the center. Check again for trueness. • Clean the lathe center points and the center holes in the workpiece. • Adjust the tailstock spindle until it projects about 3 inch beyond tailstock. • Loosen the tailstock clamp nut or lever. 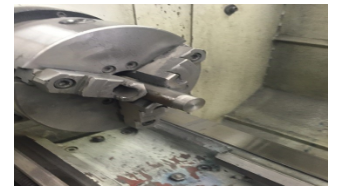 • Place the end of the workpiece in the chuck and slide the tailstock up until it supports the other end of the workpiece. • Tighten the tailstock clamp nut or level. • Tool holders are used to hold lathe cutting tools. • To install, clean the holder and tighten the bolts. • The lathe’s tool holder is attached to the tool post using a quick release lever. • The tool post is attached to the machine with a T-bolt. To reposition the cutting tool, move the cross slide and lathe saddle by hand. Power feeds are also available. Exact procedures are dependent on the machine. The compound provides a third axis of motion, and its angle can be altered to cut tapers at any angle. 1. Loosen the bolts that keep the compound attached to the saddle. 2. Swivel the compound to the correct angle, using the dial indicator located at the compound’s base. 3. Tighten the bolts again. 4. The cutter can be hand fed along the chosen angle. The compound does not have a power feed. 5. If needed, use two hands for a smoother feed rate. This will make a fine finish. 6. Both the compound and cross slide have micrometer dials, but the saddle lacks one. 7. If more accuracy is needed when positioning the saddle, use a dial indicator that is attached to the saddle. Dial indicators press against stops. 1. Place the steel rule between the stock and the tool. 2. The tool is centered when the rule is vertical. 3. The tool is high when the rule is lean forward. 4. The tool is low when the rule is lean backward. 1. Reference the center of the tailstock when setting the tool. 2. Position the tip of the tool with the tailstock center. 1. Please list the ten most important parts of the Lathe. 2. Please list five Lathe safety guidelines. 3. Why is cutting speed important? 4. What is a Toolholder? 5. Where do you mount a Toolholder? 6. How far do you extend the cutting tool in the Toolholder? 7. Please list three different cutting tools. 8. Please describe the positioning of the tool. 9. 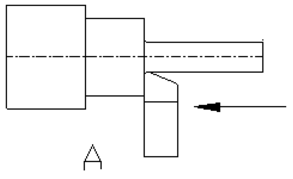 Explain how to center the workpiece. 10. What are the two way to center the workpiece?